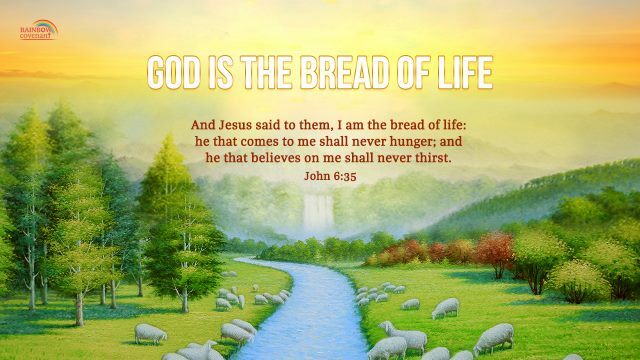 Here God wants to tell us what we need more is the bread of life, the eternal life. Only those who believe in God and seek the truth will never thirst, for God is the source of the truth. The Bible says, “Man shall not live by bread alone, but by every word that proceeds out of the mouth of God” (Matthew 4:4). God says, “God Himself is life, and the truth, and His life and truth coexist. Those who are incapable of gaining the truth shall never gain life. Without the guidance, support, and provision of the truth, you shall only gain letters, doctrines, and, moreover, death. God’s life is ever-present, and His truth and life coexist. If you cannot find the source of truth, then you will not gain the nourishment of life; if you cannot gain the provision of life, then you will surely have no truth….” From God’s words, we can feel that to know God is the most meaningful thing in man’s short life. The best food for man is not money, family, or knowledge … but the truth that can give man eternal life. In all your ways acknowledge him, and he shall direct your paths. – Proverbs 3:6 Thoughts on Today’s Verse… This verse tells us to do everything according to God’s will and He will guide us to understand more truth and find the way forward. Then how to understand God’s will..